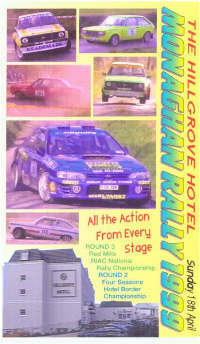 The Monaghan Stages Rally returned to Monaghan Town and the Hillgrove Hotel. As usual there was a huge entry for this ever popular and increasingly competitive rally. After the previous years rain, Monaghan was soaked only in sunshine, as the rally crews battle over tyre choice. With cameras on every stage at some of the best points, you'll need to fasten your seatbelt, as the Subaru's and MkII Escorts slide their ways around the tight twisty roads of Monaghan.